This artist's illustration depicts gas flowing from the star can spin the pulsar up to hundreds of revolutions a second and allow it to resume its lighthouse-like beams of radiation. WASHINGTON ? A newly discovered trove of strange spinningstars in our galaxy could help find evidence for Einstein's prediction ofgravitational waves. The peculiar stars are very dense, strongly magnetic starscalled millisecondpulsars, which rotate hundreds of times per second ? faster than a kitchenblender. Seventeen of these objects were recently identified with help fromNASA's Fermi space telescope, which scans the skies in high-energy gamma-raylight. 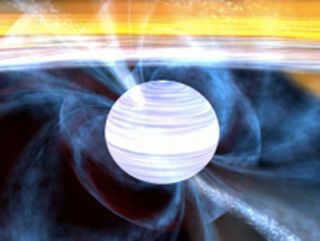 The findings were presented Tuesday at the 215th meeting ofthe American Astronomical Society in Washington, D.C.
Pulsars are created when massive stars die and collapse insupernova explosions into compact objects made only of neutrons. When roughlythe sun's mass is packed into a tiny space about the size of a city, theconserved angular momentum causes the resulting neutronstar to spin very rapidly, and to emit a ray of light that sweeps aroundlike a lighthouse beam. If the pulsar is aligned with Earth, the light beam willcross our planet once every rotation, creating a pulse of light visible at aregular interval of a few milliseconds or seconds, depending on the pulsar'smass. In fact, pulsars are nature's most precise clocks. Scientists hope that by monitoring the pulse rate of a largenetwork of pulsars over an extended time, they can create a kind of galacticGPS to find evidence for long-sought gravitational waves. Gravitational waves are theorized fluctuations in thecurvature of space-time predicted by Einstein's theory of general relativity.These waves should propagate through space, transporting energy known asgravitational radiation. And gravitationalwaves could show up as a kind of correlated wiggle in a network of pulsarclocks. "The Global Positioning System uses time-delaymeasurements among satellite clocks to determine where you are on Earth," saidresearcher Scott Ransom of the National Radio Astronomy Observatory inCharlottesville, Va. "Similarly, by monitoring timing changes in aconstellation of suitable millisecond pulsars spread all over the sky, we may beable to detect the cumulative background of passing gravitational waves,"said researcher Scott Ransom of the National Radio Astronomy Observatory inCharlottesville, Va. The detection of the new objects could greatly aid thesearch, since millisecond pulsars are relatively difficult to detect ? onlyabout 60 total had been found in the Milky Way before now. Because pulsarsshine brightly in gamma-ray light, among other wavelengths, Fermi was able tomap a bevy of possible pulsar sources that astronomers then verified with othertelescopes. "Fermi points us to specific targets," said PaulRay of the Naval Research Laboratory in Washington, D.C. "It's like havinga treasure map."